“What is Navratri? I know! Navratri means holidays for school, correct mummy”, squealed my little daughter. As a mum, I love questions like these. I find them great conversation starters to explain a bit about our culture and get her excited at the same time. 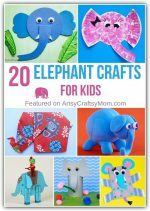 If you are like me and want to get your child involved in the festivities, using crafts, puppets, and activities, then these activities are both fun and educational. Navratri (Nine Nights), culminating with Dussehra, is a cultural festival of great importance and significance in India. According to the great Hindu epic Ramayana, Lord Ram fought Ravana in an epic battle that lasted nine days and on the tenth day Rama killed Ravana and that day is Dussehra. Dussehra is also called Vijayadashami and is celebrated as the victory of Goddess Durga over the demon Mahisasura. We celebrate the victory of good over the evil and success of truth over lies. In the Indian state of Gujarat, men and women gather and dance every night of the Navratri to a dance form called Garba and Dandiya. This is now very popular in most parts of India and was a big event in our Hometown. Navaratri brings in Garba or the Dandiya raas. A dance form depicting Lord Krishna’s dance with his gopikas.. Typically danced with 2 wooden dowels / sticks decorated in festive colours. 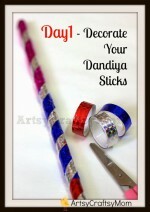 At home too, we decided to decorate our dandiya sticks ..
Once the Sticks are ready, wear a traditional dress and go out and party!! Make cards for the family. We love making Foam crackers at home as cards and door decorMake cards for the family. The whole house gets a thorough cleaning .. New curtains, new clothes .. and house gets a festive look and feel.. We put a different rangoli everyday. Kundan Rangolis are quite the rage these days ..
We love decorating the house with gorgeous Flowers .. Paper flowers are easy to make and stay a long while. You use these flowers as a table decoration, String them up or make a Toran. In Karnataka, We keep a Golu at home – Its a multi step setup decorated with dolls. Many depicting Indian Mythological characters and stories. It’s a complex structure and we love visiting friends who keep them..
My dearest friend, Arthi Anand, author of the kids’ bestseller ‘Ranganna ‘ and Founder of ‘Arts Tales With Arthi Anand’, posted this lovely explanation on Facebook and I’m sharing it here with her permission. Navaratri Golu is a doll festival that gets the entire family together in a flurry of activity. Lofts & Storage spaces are emptied of cartons/ bags holding precious dolls. Why would you do that to the dolls instead of keeping them accesible to play? Golu/ Kolu/ Bombe Habba is celebrated across four of the Southern states- TN, Andhra,Telangana and Karnataka. Not all celebrate it though since it is as tedious as it is fun, to set up, maintain, pack and unpack all these dolls, not to mention have space to store them. Also it is believed once you begin the tradition, it needs to be continued each year, at least in a token way. Traditionally, Kolu, the doll festival provided more opportunity for craftsmen- potters, sculptors, handicraft makers to express their creativity. In ancient India, it is said that a king came up with the festival to ensure that unoccupied temple sculptors could put their talent to use and earn a livelihood . Some believe that the festival assisted the desilting of irrigation canals and riverbeds, by raising the demand for soft clay for doll making. And today, it continues to be an important occasion for socializing for women and promotes creativity in the family. And as for the religious significance – it is that of celebrating the Devi and the triumph of good over evil. Just prior to Navaratri, a step shelf is set up, with an odd-number of racks ( Kolu Padi), using metal/ wooden planks. Creativity is employed in making steps using existing furniture, books and cartons and all of this is coaxed into a proportionate and stable structure. After the steps have been covered with sarees/ dhotis/ other fabric/ paper ( no mean task, like wrapping a giant Jenga tower) the stage is set. On Day 1 the kalash (holy pot/ kumb) with fresh water, a coconut and mango leaves is prepared and set on the shelf, often the upper most or the lower most one. Then the dolls are organised with much enthusiasm and debate. The optimal doll placement is discussed, order of the Dashavatar is challenged ( and googled) and resolved. Sort of like the hierachy of needs/ evolution, the Gods are placed at the topmost level ( including a Dasavtar, Rama family and Ashtalakshmis).This is followed by royals, leaders and thinkers, making way for common daily life scenes in the form of art & culture- dance/music concert sets, schools and weddings, local vendors and businesses ( Chettiar Bommais are very typical) and agriculture & related produce, and finally animals / insects at the lowest level. Sprouted grains/ legumes are used to depict the farm lands on a side display. Golus may follow a theme and the exhibits depict myths and stories out of Ramayan/ Mahabharat or even a scene from a recent travel the family has been on. These dioramas are quite fascinating and educative. In TN the mandatory dolls are the “Marappacchi Couple”, a pair of a male and a female doll, gifted at a girl’s wedding by her parents. The dolls can be dressed up each year before occupying their place in the Golu. Earlier most dolls were made from clay and then paper mache. Now they come in all sorts of materials and styles. While handicrafts ( from Kondapalli, Chennapatna, Mysore, Cuddalore, Thanjavur, nowadays Orissa, Bengal and Rajasthani vendors also sell their wares pre Golu ) are preferred, there is no dearth of machine made dolls, from Barbie to Transformers to Chota Bheem. Like any festival, Golu also has evolved as per the family’s beliefs and convenience. But typically, ladies and children get invited to enjoy the dispaly, sing songs, enjoy the eats of course and collect a goody bag. Adults and children look forward to the chundal/ sundal prasad (which is made of legumes such as channa, peas, peanuts usually soaked, boiled and seasoned) and compare notes on the size of the collection and which aunty made the yummier one. Rather like Halloween. The treats also include traditonal sweets and fruits. Women are given betel leaves & nuts, coconuts, flowers, bangles, haldi -kumkum. As a guest, you will fit in well and be appreciated if you dress up in traditional clothes and sing a classical bhajan or any spiritual song or play an instrument. A visitor need not carry any gift, but a small ethnic item to add on to the dispaly or some fruits are always welcome. Among the various festivities, three days are of greater importance. On Ayudha pooja (worship and thanksgiving to tools, implements and vehicles) machines and technology are worshipped, especially in factories. On Sarawathi Puja, books and music/ dance aids are worshipped.The next day Vijayadasami, marks happy beginnings and children often begin their education symbolically with the father/ family elder on that day. Try and visit the Golu, in the late evening, on any of these days. On the tenth and last day, the Golu dolls are symbolically made to sleep and packed lovingly and shall enjoy the rest, till the next year. Navratri Special Neivedyan recipes and Sundal Recipes are a must for Navratri .. I love subbuskitchen for yummy traditional recipes. Dussehra is also a great time to read the Ramayana. Have a puppet show at home or in your local colony. The Raam Leela ( puppet style)will be a big hit.  Disclaimer: This post contains affiliate links. What does that mean? Basically, if you loved the information and decide to purchase anything through the link, then the author of this post will receive a small percentage of money from the company at no extra cost to you. This helps us immensely in maintaining the blog and continuing to provide you with awesome content. Thank you in advance if you do decide to make a purchase. A very comprehensive post and some interesting easy to do ideas.love it. hey! Loved your post. Anyway I could contact you to talk about a collaboration? this is a super website, lots of aspiring activities, good job , keep it up. love the presentation, i would like to involve my son as maximum as possible in traditional activites! My son anant std.of class 1st. Now a days general activities are going on in his school and class teacher asking for a chart on dussehra. So if you have any relevant ideas or picture please share with on my email. Your post is very attractive. Navratri 2016 is here and it is a festival that celebrates the nine avatars of Maa Durga. Can you make something special for this festival. Love, love your website. 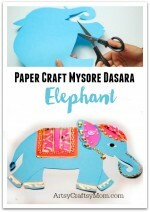 For people like me who live in the US, it is hard to find fun crafts to do with an Indian twist (without getting too religious). So inspiring to see moms like you who are making it easier for us. Kudos to you! We are a online platform, manage the entire life-cycle of a school going kid. Wanted to check if you will be interested to partner or sell these items to us as well for listing and selling on our website. Hello Shruti, First of all, great craft activities for kids. it can best activities for festivals. keep inspiring us. Wonderful post… Loved your site…I too love craft work. The creative ideas and decorations that you have sprinkled in your post looks good. Thank you so much for sharing your artwork.